DETROIT, Michigan, January 21, 2016 (ENS) – President Barack Obama was in Detroit Wednesday to check out the new climate-friendly cars at the North American International Auto Show, NAIAS, and to showcase the resurgence of the American auto industry. Obama today and saw a show floor filled with innovation in transportation technology that will help drive the future of the global automotive industry. 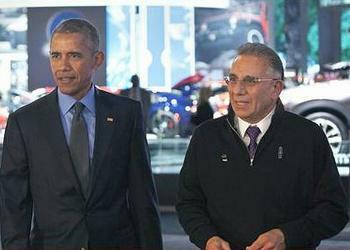 In his first visit to NAIAS, Obama toured the show with 2016 NAIAS Chairman Paul Sabatini and UAW President Dennis Williams, making stops at several exhibits, including Chevrolet, Fiat Chrysler, Ford and ZF. Before his tour, the President met privately with Sabatini, NAIAS Co-Chair Sam Slaughter and the auto show’s Executive Director Rod Alberts. In Cobo Hall, half of the show floor was blocked off by a black curtain so Obama could explore the show without the crowds. Obama viewed self-driving vehicles and advanced powertrain technologies, as well as new concept and production vehicles. He visited Fiat Chrysler’s plug-in hybrid model of the Chrysler Pacifica minivan that debuted at the show. Then the President took a look at the 2017 electric Chevy Bolt, with a 200-mile range. He toured the display with General Motors President Dan Ammann and the head of the Chevrolet nameplate Alan Batey, then got into an metallic orange Bolt. Finally, Obama checked out the Ford stand and admired the Ford Escape Hybrid. 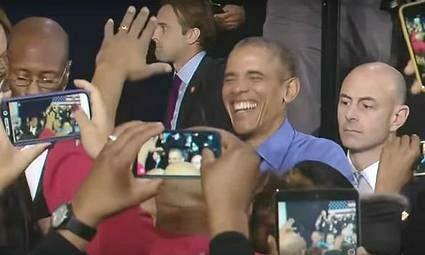 Then the President spoke to auto workers at the nearby United Auto Workers-General Motors Center for Human Resources. “I already drive in a great American car, which we affectionately know as The Beast,” Obama joked, referring to the presidential limo, a $1.5 million Cadillac – a moving fortress impenetrable by bullets and bombs, designed from the ground up by the Secret Service. The President has 12 identical limos in rotation and at least two cars travel with Obama wherever he goes. Manufactured by General Motors in Detroit, the limos have V8 gasoline engines that get just 3.7 miles to the gallon. “I have to give it up next year so I figure I ought to do a little browsing now at the Detroit Auto Show. If you’re looking for the world’s best cars and the workers who make those cars, you need to be in Detroit, Michigan,” Obama said to enthusiastic applause. The President talked about the tough call he made during his first few months in office to place a bet on American workers, American manufacturing and the city of Detroit by providing temporary federal assistance to rescue the auto industry. The federal government’s $80 billion auto industry bailout was unpopular at the beginning of the Obama administration, but it paid off, he told the audience of auto workers. Today, he said, America is in the middle of the longest streak of private-sector job creation in the country’s history. 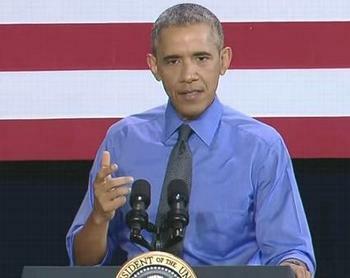 “Today factories are humming, business is booming, the American auto industry is all the way back,” said Obama. Manufacturing has created nearly 900,000 new jobs in the past six years and the auto industry had its best year ever in 2015, according to the White House. “I believe in private enterprise and I believe in the incredible dynamism of the American economy and that’s business,” Obama told the auto workers. “Over at the auto show I saw plug-in hybrids and electrics and fuel-efficent cars that can protect our planet and save people money at the pump. You’re working on self-driving cars that one day could prevent accidents and save lives. This year my administration is going to get more of those cars on the road,” he said. President Obama is one of three U.S. Presidents to visit the auto show in Detroit. President Bill Clinton visited NAIAS in 1999 and President Dwight Eisenhower toured the then-Detroit Auto Show in 1960.